We recently were in New Orleans and stopped by the world famous Cafe Dumont to try one of their beignets. These square shaped donuts were so good...we decided to make them ourselves! Just don't forget the powdered sugar...lots of powdered sugar! 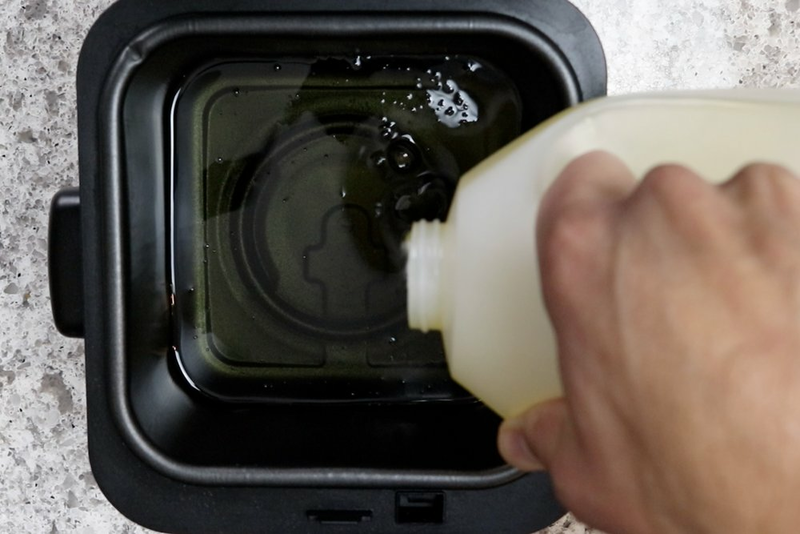 1 .In a medium bowl, dissolve the sugar in the warm water. Add yeast and stir together. Cover bowl with plate and let sit for 15 minutes. If yeast activates correctly, the mixture should be foamy. 2. In a large bowl or in the bowl of a stand mixer, add the yeast, milk, egg, salt and vanilla. Whisk together until combined. 3. Slowly add the flour and mix with a large spoon or the paddle attachment for your mixer. The dough will be very sticky. 4. Finish adding the rest of the flour and knead the dough with your hands on a floured surface or use the hook attachment on the mixer. Do not over knead. 5. When dough is holding together nicely, transfer to a large oiled bowl. Cover loosely with plastic wrap or with a kitchen towel. Let dough rise for 2-3 hours until it has doubled in size. On a floured surface, roll out the dough into roughly a 9”x12” rectangle around ¼” thick. 7. Using a knife or a pizza cutter, cut the dough into 2”square pieces trimming the edges when necessary. 9. Drop a few dough squares into the hot canola oil and spoon oil over the top of each of them while cooking. 8. Heat oil in a deep fryer or a Dutch oven to a temperature of 350-370 degrees. 10. After around 30 seconds, flip the beignets over with the spoon and repeat basting on the other side. Beignets take around 2 minutes to cook and will have a nice golden brown color. 11. Drain the biegnets on a wire rack and let cool briefly before dusting them generously with powdered sugar. In a medium bowl, dissolve the sugar in the warm water. Add yeast and stir together. Cover bowl with plate and let sit for 15 minutes. If yeast activates correctly, the mixture should be foamy. In a large bowl or in the bowl of a stand mixer, add the yeast, milk, egg, salt and vanilla. Whisk together until combined. Slowly add the flour and mix with a large spoon or the paddle attachment for your mixer. The dough will be very sticky. Finish adding the rest of the flour and knead the dough with your hands on a floured surface or use the hook attachment on the mixer. Do not over knead. When dough is holding together nicely, transfer to a large oiled bowl. Cover loosely with plastic wrap or with a kitchen towel. Let dough rise for 2-3 hours until it has doubled in size. Using a knife or a pizza cutter, cut the dough into 2”square pieces trimming the edges when necessary. Heat oil in a deep fryer or a Dutch oven to a temperature of 350-370 degrees. Drop a few dough squares into the hot canola oil and spoon oil over the top of each of them while cooking. 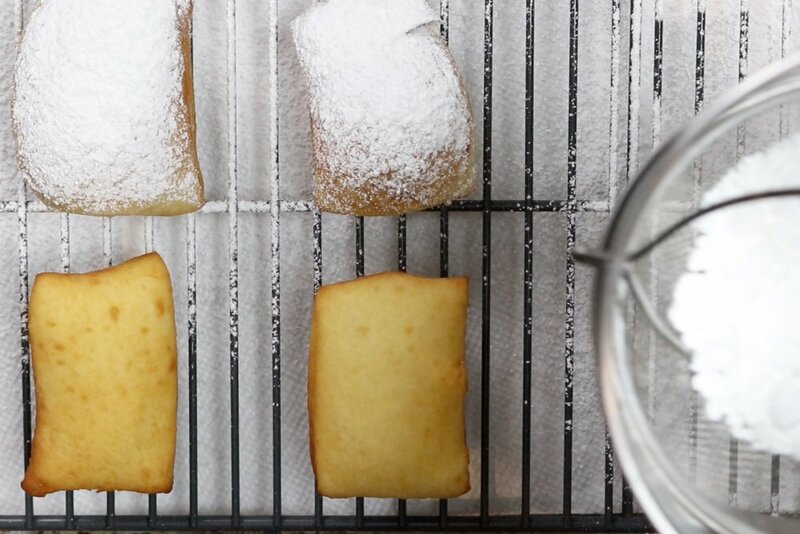 After around 30 seconds, flip the beignets over with the spoon and repeat basting on the other side. Beignets take around 2 minutes to cook and will have a nice golden brown color. Drain the biegnets on a wire rack and let cool briefly before dusting them generously with powdered sugar. If the yeast doesn’t activate, your water was probably too hot, and you have to start over with less hot water. 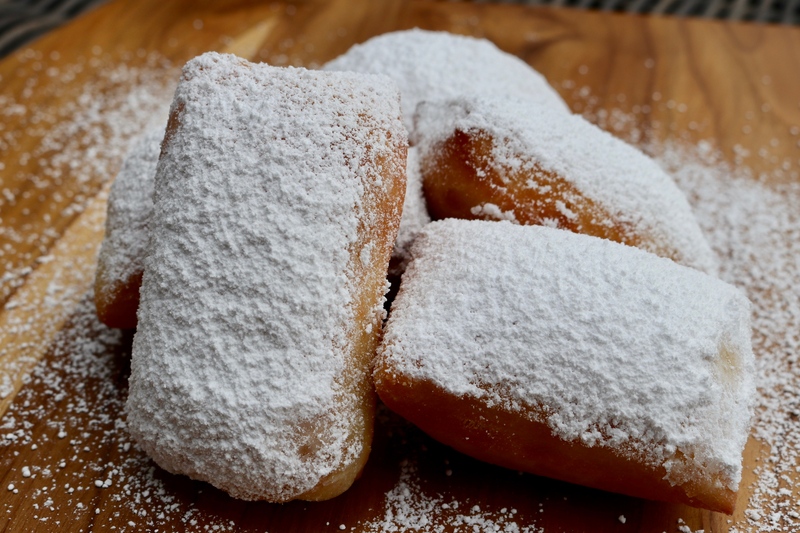 I used Canola oil for this recipe, but traditional beignets are cooked in cottonseed oil. It's just a preference and doesn't affect the recipe.